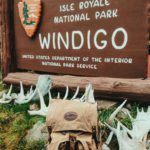 Aptly packed, the Windigo could make a good seat, pillow, pocket, signal device, summit or day pack, foraging pouch, and more. It’s a versatile, functional, high visibility addition to most any pack or kit you choose to carry. 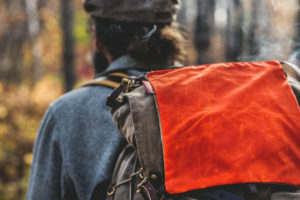 Here’s a handy zip top bag, perfect to keep often-used gear in one spot, plus, with bright orange on one side and field tan on the other, you have the choice to blend in or stand out. Built from waxed canvas, the Windigo is tough, reliable, and weather resistant all around. Use the Signal Bag as a divider or pouch inside another pack or bag. It’s compatible with our XP snap Accessory Bags and bigger packs, too, like the Voyageur or Garment Cover. String some cord (our 75” length works great) through the solid brass rings to make a set of basic shoulder straps— voilla, you’ve got a little daypack! Or lash it onto the outside of a bigger pack for a zip top lid (our bike bag replacement straps do the trick). The top D-rings on our Isle Royale Bushcraft Packs line up like it was made for it, so do the tumpline buckles on any of our canoe packs. The lash squares on the lid of the Summit Expedition work too, so do the rings on the Itinerant or Mesabi Range packs, as well as the loops of the Itasca Outset. There’s almost no limit to what you can attach the Windigo to, or how to do it. What a bright idea! How did you make it this far without one? Frost River Canvas My State Buckskin Patch Info Below. this is a great pouch that works well with my isle royal jr pack, but could also work with a variety of backpacks. the version i have is with the orange on one side. we hike in some state forests that also allow hunting so its nice to be able to flip to the orange panel for safety. i found it best to attach using the roller buckles. great pouch!